The Scotland Act 2016 devolves 11 current UK social security benefits to the Scottish Parliament, along with powers to top-up other existing benefits and to introduce new ones. With spending estimated to be about £3.3 billion every year once fully implemented, this represents about 15 per cent of overall current social security spending in Scotland. 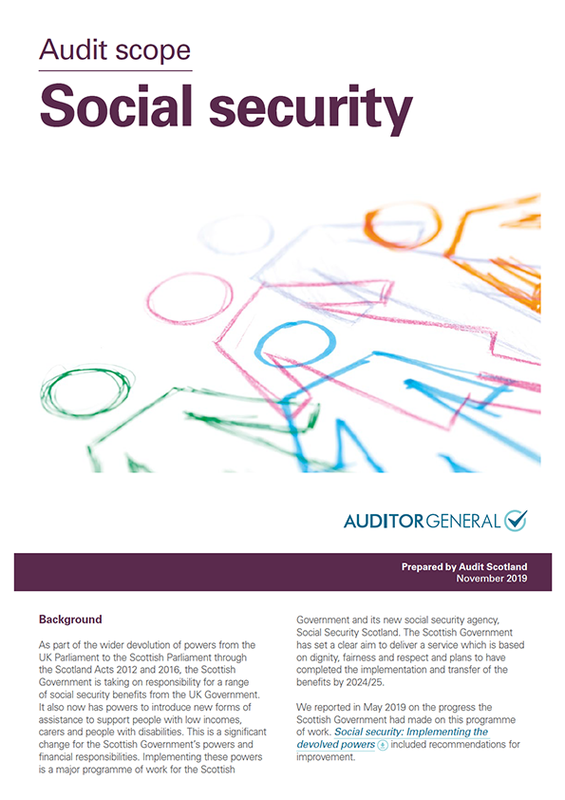 The new social security powers are a significant responsibility for the Scottish Government, providing both opportunities and risks. The Scottish Government has set out its ambition to deliver the devolved social security powers based on the principles of dignity, fairness and respect. This audit will examine how effectively the Scottish Government is managing the delivery of the social security powers being devolved under the Scotland Act 2016. We have published four audits to date on implementing the range of financial powers and responsibilities of the 2012 and 2016 Scotland Acts. Given the scale, complexity and financial impact of the social security powers, this audit will focus solely on these powers.